Today starts the first step of the new and improved granny rose crochet-a-long. The yarn pictured is Stylecraft Special DK. And those are the colors. There's one skein of each. I ordered mine from Deramores.com. A 100 g skein is less than $3 and shipping is free from the UK with an order >$50. It takes two weeks to arrive (from UK to Utah). I am going to make an afghan for a baby girl. I like square blankets for babies. The afghan will be made up of 8 x 10 granny squares for a total of 80 squares. I also like even numbers for afghans, as they seem to fold better. when not wrapped around the baby. or even make a pillow, as demonstrated in the pattern. Can be purchased by clicking here. As stated above, but please use any yarn you would like. This project has great stash-busting potential, too. White will only be used to join the squares and for the edging. Meadow will only be used for the "leaf" row. There are nine additional colors for the flowers and granny row. Either Candy Floss or Soft Peach can be used for the roses, or both if you would like. but I think Candy Floss would be better if you want an afghan a bit brighter than mine. The Roses will be explained in more detail next week in Week 2 - The Rose. Mine is creamy half caf coffee! Each week I'll include tips to help you along the way. Mini hair clips to hold in the ends of the yarn balls! I found these at the grocery store. Oh and if you are a crochet lover, check out the Felted Button site. because we are going to make 80 roses!!! Ooh, how exciting! I'm in, Astri! I've been wanting to make one of these for a long time. Great Kate! I hope to see your project! Thank you Amy. You ahead always such a supportive friend! Oh it sounds like so much fun. Hugs and good luck to all participating. Hi Astri. How I would love to do this CAL! I am afraid if I do, I will be over extending myself though. I am doing a sew along with the Vintage Farm Girl book too. And trying to learn how to use a new embroidery machine as well. The roses are lovely! 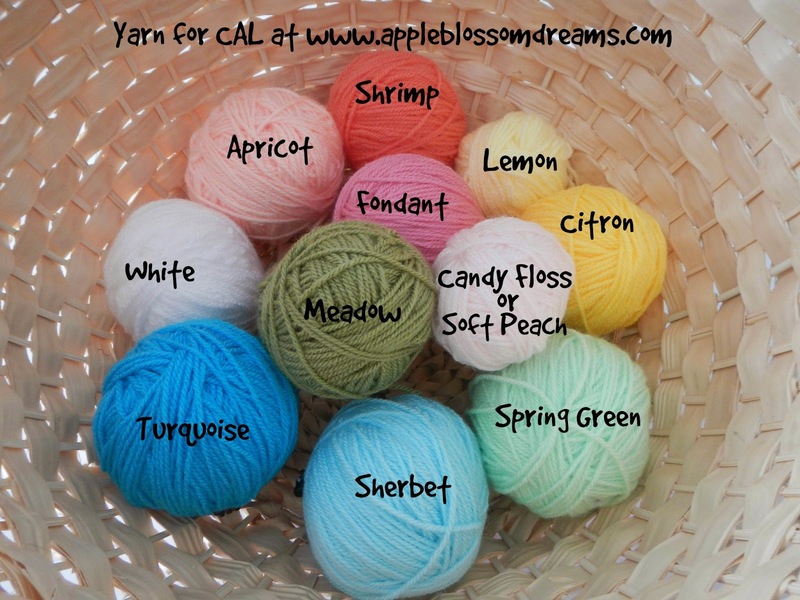 I adore that yarn! I should order more!